Last week I posted various links with information on how you can get more green in your life. Today I'm going to post about getting more green in your diet. I don't mean the sustainability kind of green (though of course it can be that, too); I mean the crisp, lively, juicy spring green that's so welcome when you're starting to have had your fill of root vegetables. The look of my local farmer's market is changing rapidly these days, exchanging the warm yellows and oranges of winter citrus for the vibrant greens of spring vegetables. Gone are the blood oranges and cara caras; in their place are tables overflowing with fresh peas. Last weekend we even got our first fava beans, and I was ready with a recipe. A green recipe! 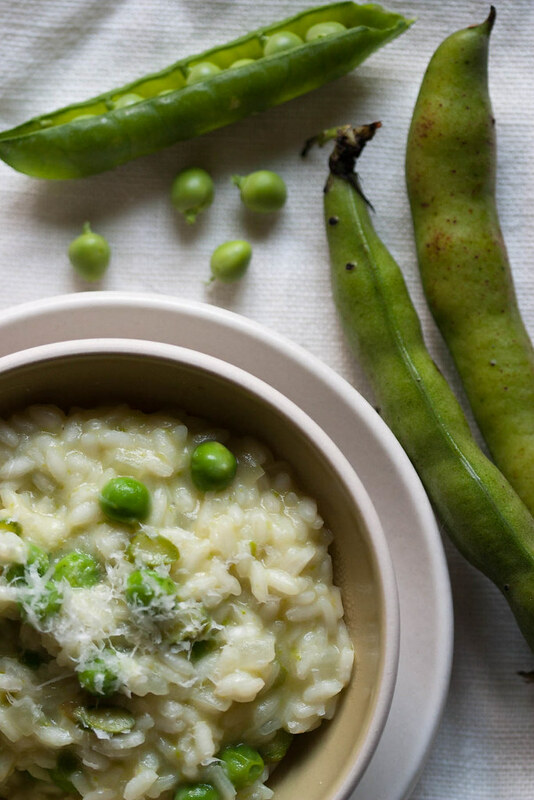 This risotto has been on my to-do list ever since I came across it in Alice Waters' Chez Panisse Vegetables last summer (after the favas had disappeared from the markets, naturally) because it combines one of my favorite things about spring (fresh peas) with one of my favorite things in general (risotto). But it's not just peas, and this is where we really get our green on. 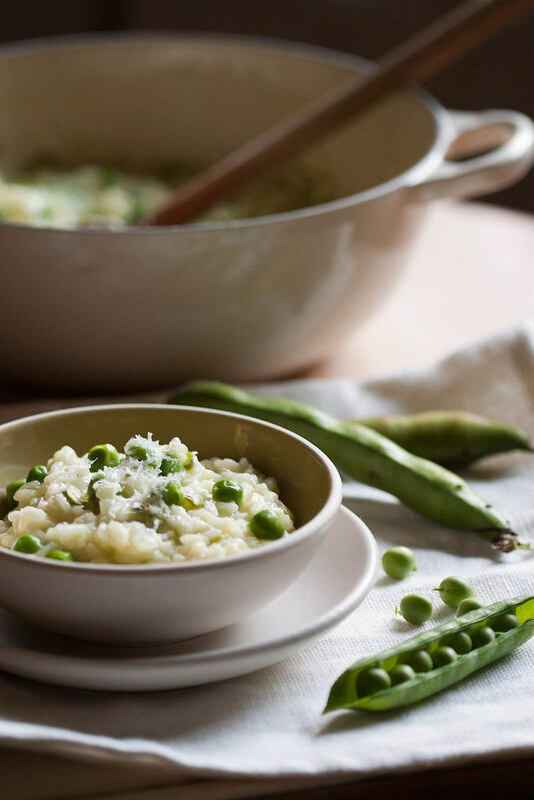 This risotto takes the best of the spring green vegetables: peas, fava beans, and asparagus. That might sound like a lot--indeed, done poorly, I can imagine the result feeling clumsy--but Waters incorporates the vegetables in such a way that none of them steps on another's toes. And although in my mind risotto falls squarely in the warming, cozy "comfort food" category, this risotto manages to be at once comforting and refreshing. I don't know how better to describe it than to say that it tastes of spring. And if that doesn't chase away the winter doldrums, I don't know what will. Bring a large pot of water to boil. 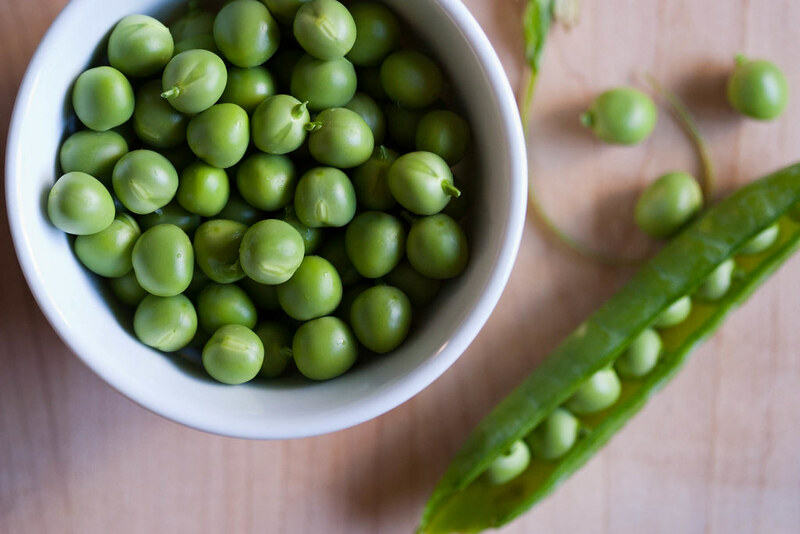 While you're waiting for it to boil, prepare an ice bath, and shell the favas. Discard--or compost!--the pods. When the water's boiling, add the favas and let them cook for one minute before draining them and shocking them in the ice bath to stop the cooking. Drain them again, then peel them by piercing the outer skin with your thumbnail at one end, and squeezing the bean out with the thumb and forefinger of your other hand. Place the peeled beans in a small pot with a glug of olive oil, a dash of salt, and just enough water so that they're almost covered. Cook them over low heat, slowly, until they're squishably soft but haven't lost their bright green color. This should take about 15-20 minutes. If the pan goes dry and the beans start to stick, add water a bit at a time. Drain them once more, then either puree them with a food processor or pass them through a food mill. While the beans are cooking, prep the rest of the vegetables. Shell the peas and prep the asparagus. 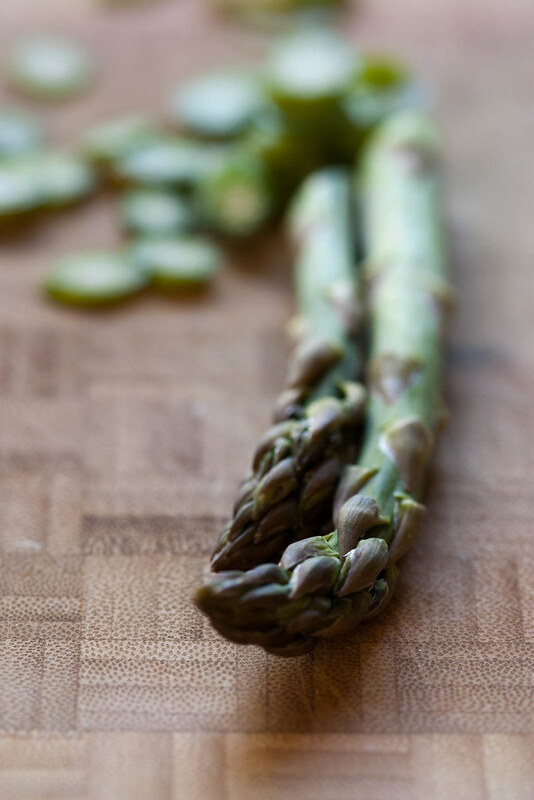 Trim the ends of the asparagus, then slice the stalks thinly on the bias. Chop the onion into small dice. When all of your vegetables are ready to go, heat the stock in a large pot and keep it at a bare simmer. Place another large, heavy pot over medium heat and add the butter. When the butter is melted, add the onion and cook until it is softened and translucent, about 5 minutes. Add a pinch of salt and the rice and cook, stirring frequently, until the rice is also slightly translucent, about 3 minutes. Increase the heat to medium-high as you pour in the white wine. Stir constantly until the wine is absorbed, then reduce the heat and add just enough stock so that the rice is covered. Keep stirring, adding more stock by the ladleful when the previous addition has been absorbed. Keep the rice at a low simmer. After 10 minutes of cooking, add the peas and the sliced asparagus, then continue with the stirring and adding of stock. After another 5 minutes, or when the rice is al dente to taste, add the fava puree, the cheese, and the remaining butter. Stir well, adding more stock if necessary to achieve the consistency of a thick sauce. Taste and adjust the seasoning, then serve immediately, with the extra cheese as a garnish. I made risotto the other night -- but the same old boring chicken. This would be a novel twist and my now commonplace theme. I wonder if I can get fresh fava beans, though? I will report back. Sorry that it has been so long since I visited. I ended up being grounded in Houston for an extra week -- so I was gone for a month in total. TOO LONG. Houston was in great form, though. I heard several people say that the weather was positively Californian! I think I've only once made risotto with actual chicken in it (other than the usual chicken stock). How do you do yours? I wouldn't be surprised if you had to wait a bit longer for favas in your neck of the woods. Curiously, we have favas, but no rhubarb--at least not at the farmer's market. I'm so glad to see you back amongst the tubes! One month does sound like quite a long time to be away from home--even when one is with friends and family. Thanks for stopping by. As for chicken risotto, I make mine from the carcass of a roast chicken. I make broth from the bones, and I keep any nice bits of meat to throw in at the end. (I just add them right before the last stir; just so they will warm through.) I like a finely diced vegetable "base" of celery, onion, carrot and garlic. On Monday I went to a cooking class and got some great inspiration for summer salads. Unfortunately, the weather isn't at all summery! High 40s all this week. Your pictures are more gorgeous everyday! Well done! 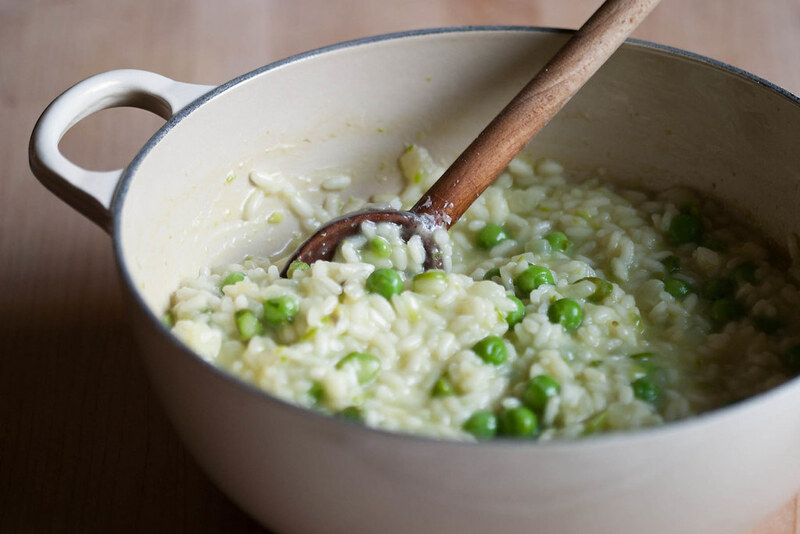 I am a huge fan of risotto and the way you prepared it with those fresh peas looks amazing! !